Currently we are looking for items relating to the Ma & Pa Railroad and its predecessors. and other buildings, time tables, annual reports, newspaper articles, employee information and photos and any narrow gauge information. - The Old Line Museum in Delta is great way to discover the history of Pennsylvania. The museum was founded in the 1970's. - The Old Line Museum is open Sunday afternoons. May through September from 1:30 pm until 4:00 pm. Appointments can also be made. -Tours available for the local students. Annually third grade and one first grade class visit. Science classes from Maryland have also visited as well as teachers during inservice science classes. 130 gifted students were given a local history program last year. We offered history, a taste of Welsh language and food, slate splitting, quarry tour, visiting an archaeological dig, etc. 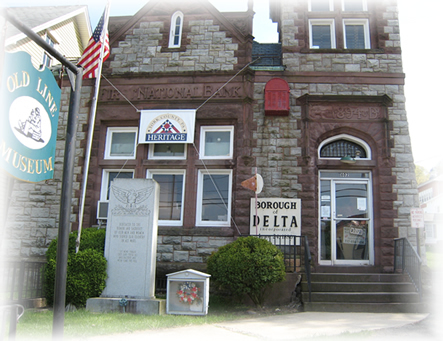 The Delta -Cardiff Volunteer Fire Company will be hosting the 17th Annual Delta-Cardiff Heritage Festival on Saturday, October 11, 2014 from 9am - 3pm. If you have participated in the past and wish to join us this year, please contact Ruth Ann Robinson for vendor info. Spaces are approx 9 X 6. It is a rain or shine event. Trinity AME Zion will offer a breakfast at the church and food vendors will be on the grounds. We are planning a local history tour, a pumpkin decorating contest, karaoke, a petting zoo and the Boys of Innesfree will return after a brief absence. This year's theme is "Our Star Spangled Community" We are hoping for patriotic items, US flags and memorabilia, where possible. -Throughout the Delta PA area. There are merchants and artists with open houses, flea markets, craft sales, tree lighting and carols. For more information, visit or call The Old Line Museum for more info.